"Learn about warranty claims management features and benefits"
"It’s Not Just All About Field Service Management; You Also Need to Build Warranty Management into the Mix"
Warranty Management is not just solely a component of field service, but also is a standalone, or integrated activity for product and services organizations alike. Be it manufacturers, dealers, or third-party users, a robust warranty management system is necessary for critical aspects of the warranty management process, which entails monitoring of policies, flat rates, fault codes, rules management, registration and claims processing. What are the strategic actions currently taken by the leading warranty management organizations? 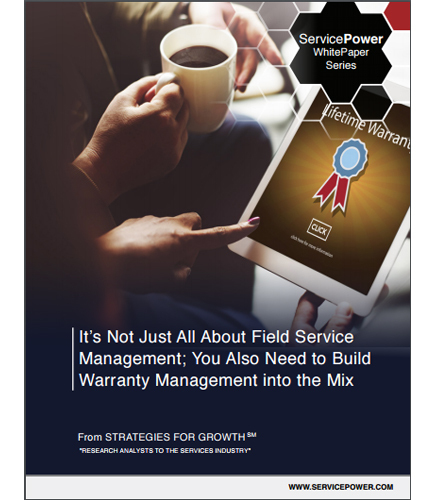 How are warranty management organizations planning to meet the exceeding customer demands and expectations? What are the top uses of Collected Warranty Management data to improve processes and effect change? Download this informative whitepaper to learn more about warranty claims management features & benefits.